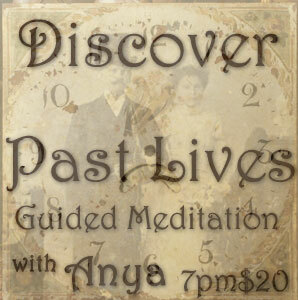 Discover Past Lives: A Guided Meditaion Workshop. Revisit your most relevant past life and help resolve current issues or just enjoy a fun flash back in this very hands on experience! We suggest you bring a pillow and blanket, water, pen and paper. Anya is an International Claircognizant Psychic using tarot, Palmistry, Astrology, Angel Cards, Runes & Numerology as her tools. She has been a Professional Psychic for over 15 years. She has worked in New York, England, Ireland, Peru, Czech Republic, Hungary, Romania and throughout San Diego County.